Music icon Loretta Lynn will celebrate her birthday this April with a once-in-a-lifetime music event. On the heels of one of the most deeply personal albums of her career, 'Wouldn’t It Be Great' (Legacy Recordings/Sony Music Entertainment), the 2019 GRAMMY nominee celebrates this year’s birthday being honored by her friends. 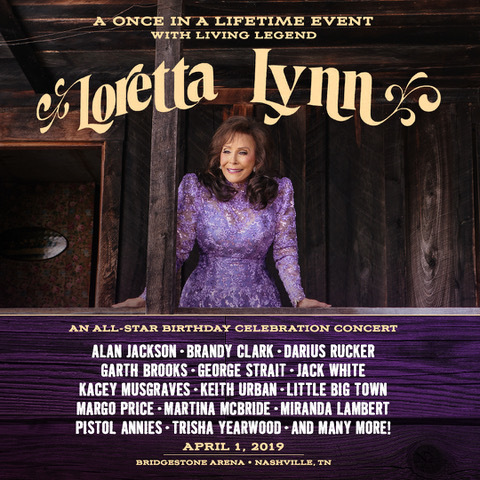 Alan Jackson, Brandy Clark, Darius Rucker, Garth Brooks, George Strait, Jack White, Kacey Musgraves, Keith Urban, Little Big Town, Margo Price, Martina McBride, Miranda Lambert, Pistol Annies and Trisha Yearwood are among the first guests announced for “Loretta Lynn: An All-Star Birthday Celebration Concert” on Monday, April 1 at Nashville’s Bridgestone Arena, produced by AEG Presents. Acclaimed music producer Dave Cobb will serve as musical director for the evening of celebration and song. Net proceeds from ticket sales benefit the Opry Trust Fund and the Country Music Hall of Fame and Museum. "I am so excited to celebrate my 87th birthday with all my friends,” shares Lynn. “This is the first time I've ever had a birthday party! My birthday wish has come true. The only other wish I have is that Keith Urban jumps out of my birthday cake!" Tickets to “Loretta Lynn: All-Star Birthday Celebration Concert” go on sale to the public on Friday, January 18 at 10:00 a.m. (central) with prices ranging from $29.50 to $149.50 (plus applicable fees) and limited VIP packages available. Use the code BIRTHDAY from Tuesday, January 15th at 10am – Thursday, January 17 at 10pm, to gain early access to tickets. To purchase tickets, visit BridgestoneArena.com.